Ashley Mews Condominium neighborhood is located just south of E. William between S. Main and S. Ashley Streets, in the heart of downtown Ann Arbor. This gorgeous complex is made up of 54 condos built in 2002 – 2003 and offer many different floor plans. These condos are modeled after the traditional brownstones of Boston and have a classic ambiance. Each is appointed with many high-end features such as; hardwood flooring, solid wood cabinetry, granite counter tops, second floor laundry room, en suite bedrooms, and secure attached underground parking. Some units offer fireplaces, bay windows and private balconies. Living at Ashley Mews is the ultimate in-town experience. Walk to all that Ann Arbor has to offer. The University of Michigan central campus and stadium are just minutes away on foot or bike. The restaurants of Main Street, shopping, the YMCA and so much more. These condos have proven to be a great real estate investment as well. Prices of the condos have continued to rise, as the chart below shows. Sale prices in this community ranged from around $600,000 – $836,000 in 2017. In 2013, prices ranged from around $400,000 – $750,000. An individual unit has sold for $1M. 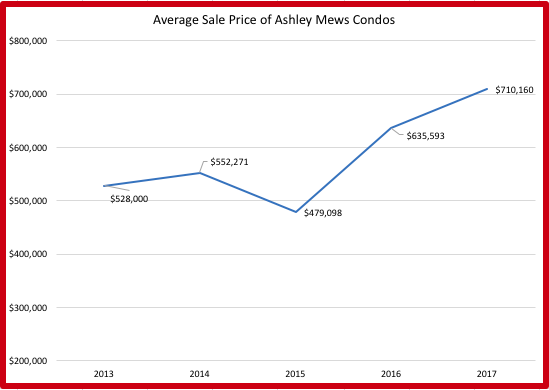 The average sale price in Ashley Mews in 2017 was $710,160 compared to the average sale price in Ann Arbor at $297,785. Homes are not readily available in the Ashley Mews neighborhood. On average only 10% of the units are available in any given year. The average price per square foot in 2017 was $453.32, showing that Ashley Mews is truly luxury living!